Promotion Activities. The Regulatory Council of Ribeira Sacra-Galicia-España. 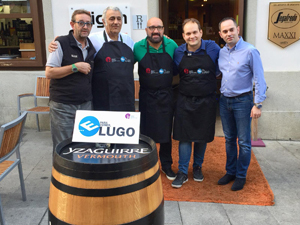 A member of the Tasting Panel has been part of the technical jury that last weekend tasted the tapas of the Lugo Tapas Competition organized by the Asociación Provincial de Empresarios de Hostelería de Lugo ("E Para Comer Lugo") to decide the winning top in the special category of Pairing with DO Ribeira Sacra. 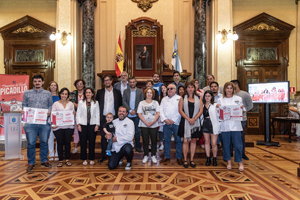 The Regulating Council, as a collaborator, presented the award to the winning establishment in the category of pairing with D. O. Ribeira Sacra in the XV Picadillo Tapas 2018 Competition held in A Coruña. During two days a group of journalists, from different countries such as Norway, Belgium, Peru, United States, United Kingdom, .... organized by the IGAPE (Galician Institute of Economic Promotion), under the promotional activity "International Galician Wine Week 2018 " they have visited the Denomination of Origin to know in first person the viticulture, the vineyards and the wines in the DO Ribeira Sacra. They have tasted several wines under the Denomination of Origin, visited the vineyards to learn about their characteristics, varieties and types of soil, and also visited the Ribeira Sacra Wine Museum in Monforte de Lemos. For three days a group of EFE Agency formed by journalists, camera technicians and translator, have been in vineyards and wineries of the Denomination of Origin to make an extensive report on Ribeira Sacra addressed to the English- Speaking public, which will deal mainly on viticulture, the different autochthonous varieties and the typicity of the land, the nature and the environment. They have interviewed winemakers and vine growers who were fully involved in the tasks of harvest, to capture in the report the impressive landscape in Ribeira Sacra, the altitude and the slope of the vineyards, as well as the difficulty of carrying out the harvesting tasks.